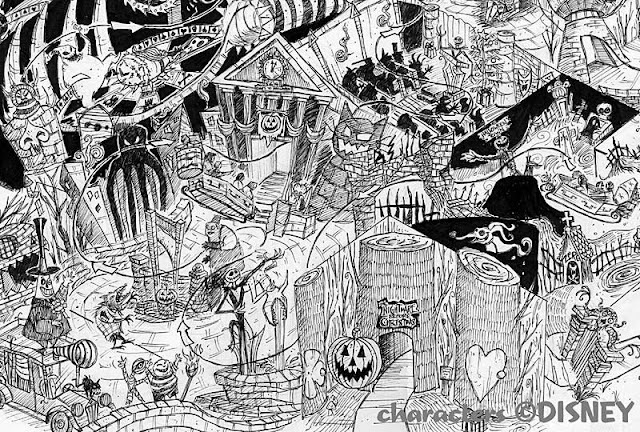 All of you who are fans of the "Nightmare Before Christmas" movie are going to love this unrealized concept by Christopher Merritt. He is a theme park designer who worked previously as an Imagineer at Walt Disney Imagineering. 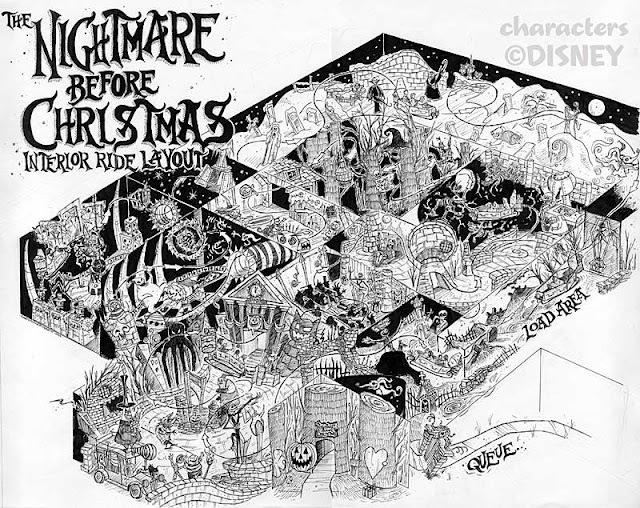 This "Nightmare Before Christmas" attraction concept was not done during his time at WDI but was part of his student portfolio back in 1996. 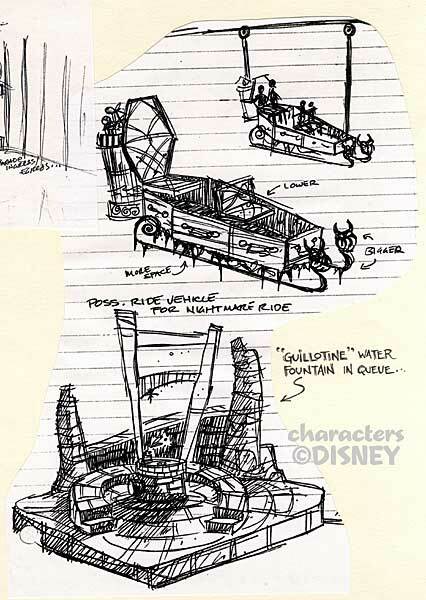 Not only we can see how a great attraction it would have been if it had been built, but the coffin ride vehicle concept would have been a lot of fun too. One of the detailed illustrations shows the design of the whole interior show, done in the traditional "fun map" style. Attraction concept and artwork is by Christopher Merritt - Nightmare Before Christmas characters: copyright Disney. How interesting, it would have been something else to see this sketch come to life. I did think the overlay was well done at haunted mansion. 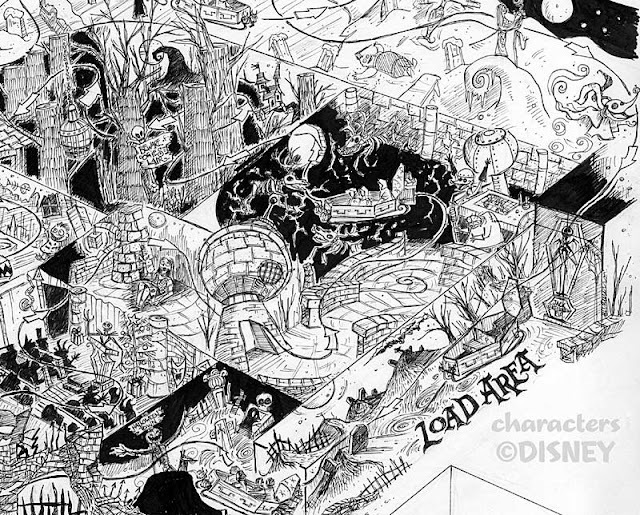 A Nightmare Before Christmas Ride would be an Amazing, and crowd drawing attraction. With as large as the fan basis has grown since its release, it would be just as popular if not more popular than existing rides. Also with its happy yet, morbid theme it gives more than enough potential to become a great thrill ride. so Disney Imaginers, keep pushing for the ride. It will defiantly do wonders. A Nightmare Before Christmas theme park ride is an excellent idea! This has always been my ultimate favorite movie. I use to wonder why they didn't build a theme park ride for this movie, being that it IS one of the most popular Disney movies ever. If this ride was built, I would definitely ride on it! Hopefully, the Disney co. decide to make this design a reality! Tim Burton is very excited about this idea, and who can disagree? TNBC deserves its own dark ride and Disney's Hollywood Studios would be the perfect place to put it! I really hope Imagineering goes ahead with this idea and can get it in motion soon. I think both Disney and TNBC fans would appreciate and enjoy an attraction like this. 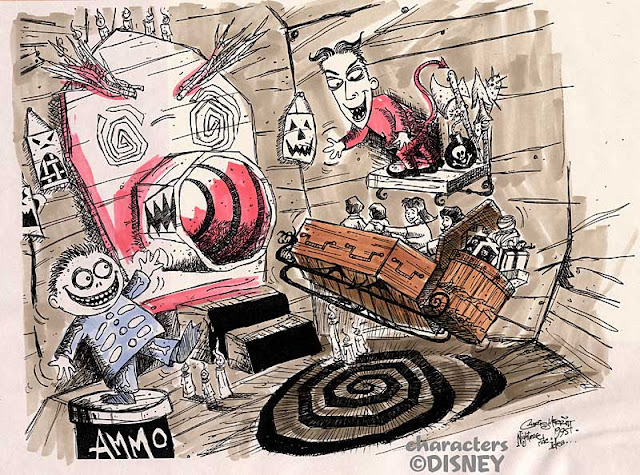 While they didn't make this ride, I'm glad that this idea was scrapped altogether, and the Haunted Mansion Holiday was born from these ideas! I love the Haunted Mansion Holiday. and it was a fantastic idea to combine my favorite ride with my favorite movie! Dude Goths aren't retarts, Most goths are actually extremely intelligent and if you meant a true goth u would learn they are not annoying. Now the new idea of goth, emos and mallgoths are annoying they know nothing of what it means to be goth. They run around crying acting depressed and intisocial even though that has nothing to do with what goths act like or believe in.